Organize Your Photos! Start Today. Looking for the article on Data Usage? Click here. Gather all your photos to one computer. Photos from your camera, your smartphones, and your tablets should all be copied to a computer and removed from their original device. I recommend putting them into folders by month, that way you don’t have to think about where to put pictures when you import from the camera. If the picture was taken in January 2015, it goes in the folder Pictures\201501 … period. No choices, no changes. If you don’t know how to view or make folders on your computer, stop right now and read this article: Forget About Picasa and Learn Files and Folders! Use Tags for Different Groupings: Let’s say you want to view all of your cat pictures together. Do not move or copy your cat pictures from their homes in the monthly folders. Leave them where they are and add a “Tag” for cat. Tags are also sometimes called keywords. You can then use Picasa’s “View Tag as Album” tool and see all the cat pictures in one group. Tags are stored in the metadata of the picture itself, so if you decide to use another program, the tags are there, right in the .jpg file. This way, you can also tag photos with the state where it was taken as well, then you could see all your Arizona pictures together, or your California pictures, or … in our case, any one of 49 states! One picture can have many different tags, so, one picture of your cat, in Arizona, at Christmas in 2013 can have tags for cat, Arizona, and Christmas. You will see it along with all the other December 2013 pictures in the 201312 folder, but you can also view the group of “cat” pictures as well as the group of “Christmas” pictures or the group of Arizona pictures. Tagging can be done at any time – even years later. You can select several photos and tag them all at once. But, as I mentioned at the start of this article, don’t worry about the last ten years, just start tagging now. Faces: Don’t use the tag feature for people’s names, let Picasa do that . It’s called name tags, and the end result will be special People Albums for each person. Start with the pictures for January 2015! Select the folder, then click the “People Pane” button. You will see faces and suggestions appear in a right sidebar. If the suggestion is correct, click the green checkmark, otherwise click the red x. If there is no suggestion, and it’s a person you want to keep, enter their name in the blank provided. Face it, not all your pictures are “keepers.” I have a hard time deleting bad pictures – so I normally don’t! But, I do know which ones I want to keep! For those I take a few seconds and add a caption. Captions are super simple and you will love yourself years later if you take just a minute to describe your pictures now. Once I’ve done that, it’s easy to see what pictures I’ve decided are my “keepers” – they have captions! I’ll also do a little cropping, color correction and other edits, then I’ll select my keepers and upload them to a web album. You can use any photo-sharing website you like, but I recommend Picasa (on your computer) and Google+ Photos (web albums) because they work together – just select the pictures you want, using Picasa, and click the Share on Google+ button. Give it an album name, select the size you want (I recommend “Best for Web Sharing”), and choose who to share with. I usually select Public here, but you don’t have to. If you leave it blank, the resulting web album will be visible to only you, then, later, you can get a link to send to someone else. All of these web albums will be available for you to look at from any device with an Internet connection. Just get the Google+ App for a mobile device, or browse to Plus.Google.com on any computer and log into your account. I love talking to someone about a place I’ve been and being able to bring up pictures on my phone without the pictures actually being on my phone! Digital Photo Frames are also a great way to view your keepers. You can export them from Picasa to the photo frame and enjoy all your pictures, running a continuous slide show on your living room wall! 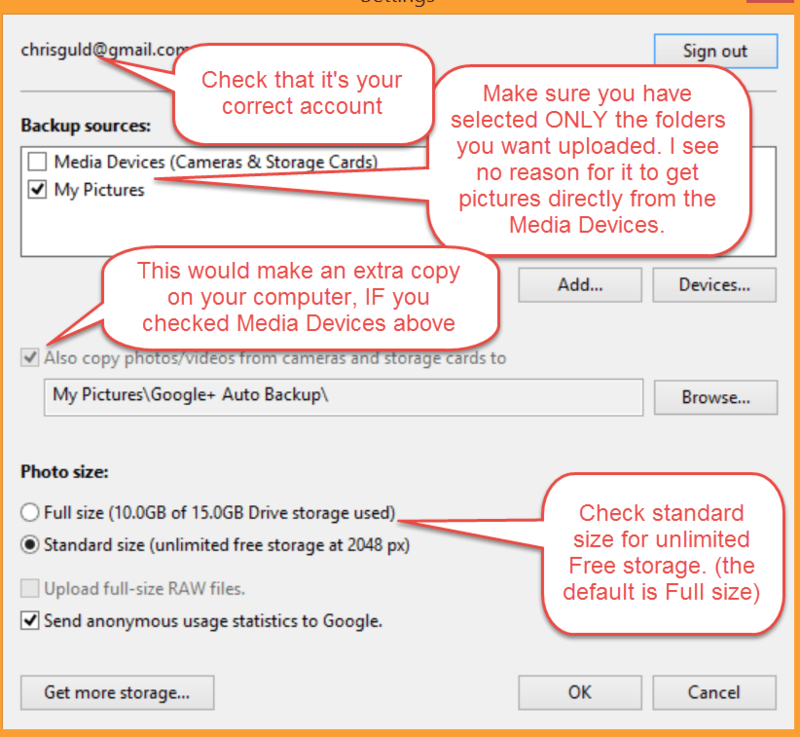 Google+ Auto Backup: When you install Picasa these days, you also get a small program called Google+ Auto-Backup. If you allow it, (you have to click OK) it will copy all your pictures to your Google+ account on the web (in the “Cloud”) I like Auto-Backup because I know that, as soon as the pictures are on my computer, even before I start messing with them, they have all been copied to a private album online in my Google account. The problem is, many people click OK without looking at the settings. Check the image at right to see what settings need to be changed. And be aware that this process uses a lot of Internet bandwidth. You don’t want to do this if you’re on a metered connection. Local Backup: You probably already have a system for local backups of your pictures, either using Picasa->Tools->Backup Pictures, or some other computer backup program. Google+ Auto-Backup does not replace your local backup for two reasons: 1) if you follow my recommendations, Auto Backup is not getting your original resolution picture, it’s being reduced to 2048 pixels. 2) Auto Backup does not preserve your folder structure. It cannot be used for disaster recovery to restore your Pictures in the folders you had them. Just start now. Gather your pictures for this month and put them on your computer in a folder for this month. Look at them. Add Tags and Captions to your keepers, and identify the faces. Then upload them to a website where you can view them from anywhere and share them with friends and family. 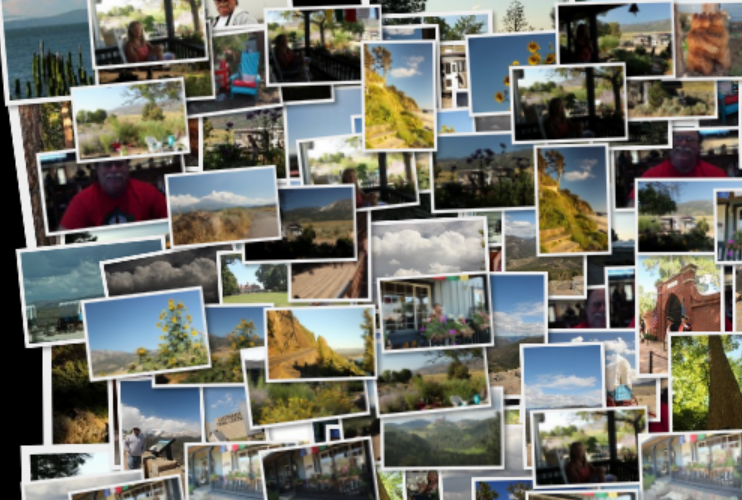 If you want to use Picasa (on your computer) and Google+ Photos (on the web) to do this, we have lots of tutorial videos to help. The following videos require membership in Geeks on Tour. 232. Forget about Picasa! Know where your pictures are WITHOUT Picasa. How about you? Are your pictures organized? What questions do you have? Leave comments below. Published by MrsGeek, in Blog. Tagged with #GeeksWhoTeach, google, Google Photos, Picasa, Technology for Travelers. Excellent, such wisdom that comes from your experience. Thank you so much for this lesson, now to practice myself.